Natalie Bohnen-Twiddy is a retired educator who lives in Kingston, Ontario. She paints in her studio at the new Tett Centre for Creativity and Learning located at 370 King Street West. She experiments with paints from around the world. Lately Natalie has been importing her paints from France because she is enthusiastic about the way they coat the canvas. Her paintings are colourful, dramatic and often large. Natalie comes from a very artistic family. Her grandfather and sister are also accomplished artists. She not only paints, but has been a keen collector of and has great affection for the impressionistic style. She has studied for decades with various artists including Lucy Manley and Joanne Purdy. She is a regular contributor to many charitable fundraisers and has donated her artwork to Artevino, The Quinte Art Council, Northumberland Hospice, and The Canadian Cancer Society, to name but a few. Her paintings have been featured in many shows with other top artists. She has done twelve solo showcases. Natalie’s artwork is part of private collections around the world. A substantial collection of her work is permanently on display in “The Gables” restaurant in Brighton, Ontario. Natalie is available for commission work and willing to consult with interested individuals in their homes to make sure that she paints a canvas that will address their home décor. Natalie Bohnen-Twiddy retired in 2000 after 32 years in education. She began her career as a secondary school teacher with the North York Board of Education. She worked for the Hastings and Prince Edward District School Board as a programm consultant, vice-principal, principal, and superintendent. She also served as superintendent of the Northumberland-Clarington and Kawartha Pine Ridge District School Board. Following her retirement, Ms. Bohnen-Twiddy acted as a supervisor for student teachers at the Potsdam Campus of the State University of New York. She is a graduate of the University of Toronto and earned a Master of Education degree from the Ontario Institute for Studies in Education. She has served as a board member of the Quinte Arts Council and as a fundraiser for Community Care Brighton and Community Care Northumberland Hospice. BRIGHTON - A local artist is helping illustrate a flourishing financial future for Community Care. 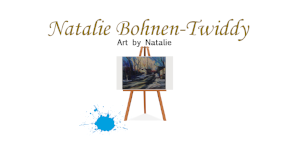 Natalie Bohnen-Twiddy is holding her bi-annual festive art show to raise funds for Community Care's numerous programs. It will be held Saturday, Nov. 7. "The services of this agency are absolutely amazing," Ms. Bohnen-Twiddy said. "This gives us a chance to further expand the awareness of what Community Care offers." Ms. Bohnen-Twiddy said she learned of the importance of Community Care through her husband, who is a doctor. "There are so many times, as a doctor, he can rely on some of their supports for his patients," she said. "We've seen the benefits in the type of care people in the community receive from Community Care." This year's art show will display 30 original paintings and the proceeds will be split between Brighton's and Colborne branches of the organization. The previous art show sold 25 of the 30 paintings on display. "The feedback from the community last time was so amazing," said Judy Murtha, Community Care coordinator. The Community Care office is completely converted into a gallery for the show. Ms. Bohnen-Twiddy makes an undisclosed donation for use of the office and donates a percentage of each painting sold. "The gift that she gives for this is far and beyond anything we can give back to her," Ms. Murtha said. "This supports us in so many ways." Funds generated through the art show are used in various programs from transportation costs to ingredients needed for the Meals on Wheels program. "It doesn't go into staffing dollars," Ms. Murtha said. "It will be enhancing the programs and perhaps as we look at things through the year, a new program." Ms. Murtha said Community Care is considering the creation of a seminar to help seniors safely handle daily tasks. "It would cover things that are important to their day-to-day life," Ms. Murtha said. "All of the things that enable an individual to remain in their home with independence and dignity." Art that is for sale can be viewed by appointment or at our studio located at the Tett Centre in Kingston, Ontario. Please email me or go to my contact page if you have any questions about my paintings or if you are interested in purchasing a painting. "Serenity at Lake Ontario Park - $2000. "Lilly Lane Kingston" - $950. Ivy Red & Gold - $750. This where you can view the art I have painted over the years.